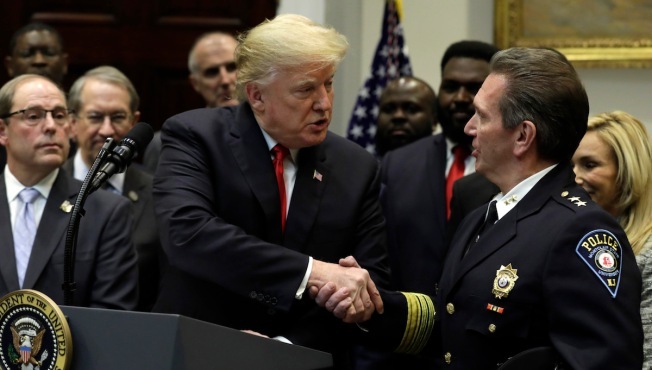 U.S. President Donald Trump, left, shakes hands with Paul Cell, president of the International Association of Chiefs of Police, during a signing ceremony for H. R. 5682, First Step Act, in the Roosevelt Room of the White House in Washington, D.C., U.S., on Wednesday, Nov. 14, 2018. President Donald Trump’s support has put Congress within reach of passing the most sweeping set of changes to the federal criminal justice system since the 1990s, when fear of crime drove the enactment of draconian sentencing practices that shipped hundreds of thousands of drug offenders to prison. This is no small feat. Reformers have been trying to get this done for years, but something always got in the way: partisan bickering, election-year politics, ambushes by opponents. Amid Washington gridlock, the First Step Act stands out. The measure, which could go to a vote during the lame-duck session of Congress between now and January, contains several changes to the way the federal government treats drug offenders, both those who are in prison now and those who will face a judge in the future, NBC News reports.